On Thursday November 10, Baja Betty's in Hillcrest is hosting its 2nd annual Nacho Daddy eating contest, where contestants attempt to speed-stuff their faces with the restaurant's signature family size plate of nachos for a chance to win prizes and bragging rights. Betty’s prides itself in having some of the best nachos in town, and at the Nacho Daddy eating contest, the fastest person to eat an entire family-size Nacho Daddy portion wins. It's $20 to enter and each contestant gets a t-shirt and a monstrous portion of nachos. The Nacho Daddy contest awards prizes for 1st, 2nd and 3rd place. First place gets $100 cash prize, one free Nacho Daddy every month for a year, a $100 Baja Betty gift card, a bottle of tequila and a video feature. Second place receives a $75 gift card, a bottle of tequila, and one free Nacho Daddy per quarter for a year. Third place is awarded a $50 gift card, a bottle of tequila, and two free Nacho Daddies within the year. Check in begins at 5:30pm on November 10 and the competition begins at 7pm. Contestants must register online in advance of the event or in person at the restaurant. Last year, the winner ate the entire plate in less than 20 minutes. Baja Betty's is located at 1421 University Avenue in Hillcrest. 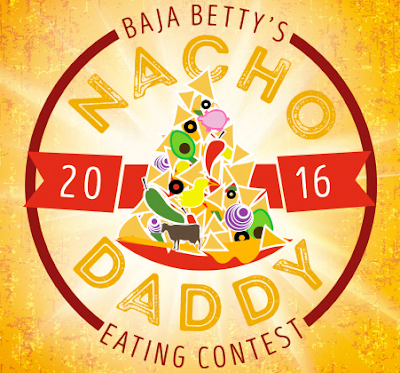 For more information and to register for the Nacho Daddy eating contest, visit bajabettyssd.com.